The Greek-German GLIOMARK consortium will be present at the EIT Innovator´s Summit, taking place in Berlin on 10th-11th September, 2018. With Athens-based ProActina SA and Berlin-based ConsulTech GmbH two small and medium-sized companies (SMEs) have been cooperating intensively for three years now in the development of a diagnostic agent for rare high-grade brain tumors (gliomas). Now, the first clinical success of this Greek-German collaboration can be announced: the clinical study Gliomark1 (phase II) has been successfully completed. At EIT innovator´s summit will take part around 1000 top innovators, investors and corporates. They will gather for hands-on workshops, relevant matchmaking, a showcase by European top innovators and inspiring talks. Dr. Alexandros Strongilos (CEO of ProActina) and Dr. Daniel Schubart (CEO of ConsulTech) will take this opportunity to meet peers, pitch the project, present their ideas in front of top investors, exchange experiences and find new partnerships. The GLIOMAKR consortium will be present at the BIO-Europe, which takes place in Berlin between 6th - 8th November 2017! Meet us using the partnering tool of the conference and discuss opportunities for cooperation! Pro-ACTINA is proud to participate in the BIO International Convention in San Diego, selected as one of the 15 European SMEs Instrument Ambassadors under the EASME Overseas Trade Fairs program aiming to support international commercialization of EU innovation. From 19-22 June 2017, pro-ACTINA will have the unique opportunity to gain first-hand experience of the US market and establish business contacts with local companies via the trade fair and business meetings. Visit us at booth #5837! The consortium will participate in Europe's largest partnering conference serving the global biotechnology industry, the BIO-Europe. You may approach us through the partnering system of the conference. We look forward to discussing cooperations with you. The consortium is pleased to announce that, on 14/10/2016 the European Commission has granted to proACTINA SA, Orphan Designation for tetrofosmin for the diagnosis of Glioma, following positive opinion by EMA. The product is registered in the “Community register of orphan medicinal products” with an EU orphan designation number: EU/3/16/1764. This achievement has been one of the major milestones in GLIOMARK project. See here the related press release. Gliomark is subject of a recently published article in Science | Business, a web site and service aiming at bringing together research, industry and policy. The article is found here. Our project has been published in National Documentation Center’s bi-monthly newsletter for research and Innovation. Please find this publication here. 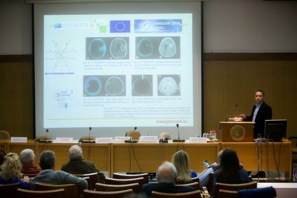 pro-Actina's CEO, Alexandros Strongilos, was invited to present the Gliomark project on Nov 3, 2015 in frame of a Horizon 2020 dedicated event organized by the Greek National Contact point. Please see the agenda and the presentation as well as a video of the presentation (in Greek). The European Commission, within the frames of Horizon 2020-SME-Instrument-Phase 2 (PHC-12), has positively evaluated the project "GLIOMARK" and approved funding of €4.7 million for the next 4 years. Objective of "GLIOMARK" is to clinically validate the permeability of the blood brain barrier (BBB) as an in vivo biomarker for the diagnosis of gliomas. This will be accomplished by means of the radiotracer 99mTc-tetrofosmin (TTF) and the imaging technique Single-Photon Emission Computer Tomography (SPECT). The project will be coordinated by ConsulTech GmbH (Germany) and implemented in close collaboration with ProActina SA (Greece).